To achieve Sustainable Development Goal 3 which entails ‘ensuring healthy lives and promoting well-being for all at all ages,’ involves strengthening of the implementation of the framework convention on tobacco control and providing access to medicines and vaccines. It also involves supporting of research and development of vaccines and medicines; increasing health financing and the health workforce in developing countries; and strengthening the capacity for early warning risk reduction and management of health risks. This was said by Prof Tiaan de Jager at recently at his lecture in the University of Pretoria (UP) Sustainable Development Goals (SDG) Lecture Series. He is UP’s Dean of the Faculty of Health Sciences and Director of the UP Institute for Sustainable Malaria Control (UP ISMC). He is also a Professor in Environmental Health in the School of Health Systems and Public Health and an Extraordinary Lecturer in Andrology in the Department of Urology in UP’s School of Medicine. 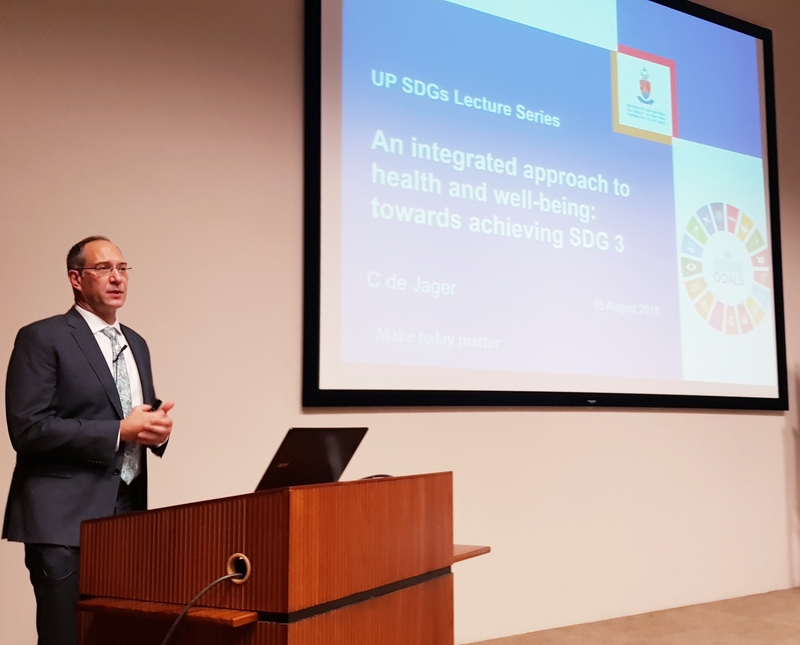 In his lecture, titled An integrated approach to health and well-being – towards achieving SDG 3, Prof De Jager said health, well-being and sustainable development were considered to be intrinsically connected – with “health regarded as a precondition indicator, as well as an outcome of successful sustainable development”. He elaborated on how the SDGs could assist towards South Africa’s National Development Plan (NDP), which was launched in 2012 and was aimed at addressing South Africa’s triple challenges of poverty, unemployment and inequality. Partnerships – mobilise the means for full implementation through a strong global partnership. Prof De Jager’s research has impacted on policy at national and international levels, with the World Health Organisation and the United Nations re-evaluating methods for malaria control based on his findings. Referring to the work of the UP ISMC, he explained that malaria was a complex parasitic disease confined mostly to tropical areas and transmitted by female Anopheles mosquitoes, which unlike other infectious diseases, was the result of a complex interplay between three biological systems each with its own lifecycle: environment, habits and pathogenesis profiles. He warned that changing climate conditions and the movement of people could possibly reintroduce the disease in areas that have been malaria-free due to successful control efforts. Relating back to SDG3 he highlighted that the goal by 2030, is to end the epidemics of HIV/AIDS, tuberculosis, malaria and neglected tropical diseases and combat hepatitis, water-borne diseases and other communicable diseases. He cautioned that it was “clear that no single control aspect will solve the malaria problem and that a number of initiatives are required for safe and sustainable malaria control”.